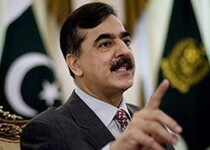 Prime Minister Syed Yusuf Raza Gilani Sunday said the Khankahi system was vital to eliminate terrorism from the country. He was addressing the annual Urs of Syed Muhammad Ismail Shah Bokhari, commonly known as Karmanwala Sarkar here. Syed Ali Shah were also present. The Prime Minister said the role of saints and Mashaikh against terrorism had been realized in and outside the parliament. "My security men advised against the visit but I reached here so that the common man should not hesitate from visiting shrines for fear of terror acts," he added. He called upon Mashaikh and Ulema to continue preaching values of Islam, advocating love, fraternity, peace and tolerance. Religiously knowledgeable people can effectively help end terrorism, he added. These were saints and not the army generals, who spread Islam in Indonesia, Malaysia and other countries while the first ever Hadith in Hindustan was introduced by Shaikh Abdul Haq Mahaddith Dehlvi, who was a 'Mureed' (admirer) of Hazrat Musa Pak (RA), he added. Gilani said Pakistan was facing numerous challenges, especially terrorism, which was affecting its economy. "The PPP-led government is well aware of people's problems including poverty, dearness and unemployment," he said, adding that the funds being spent on the offensive against terrorism would be used for public welfare soon after the elimination of terror. in the war on terror. The Prime Minister also announced construction of a road between 2A/L Adda Kassanwala and GT Road and a bridge in Renala Khurd. Earlier, Gilani inaugurated a gas supply project in Karmanwala village. Prime Minister Syed Yusuf Raza Gilani also laid a 'Chadar' on the grave of Hazrat Karmanwala Sarkar. Addressing the gathering, Foreign Minister Shah Mahmood Qureshi said negative propaganda was being made in the West to tarnish Pakistan's image. "Effective measures are needed to remove their misconception, as Islam promotes peace, equality and love," he added. Unfortunately, he added, a group of people in Pakistan was using the sacred message of Islam for its nefarious designs. "This group is also against Khankahs and saints, who changed the destiny of the sub-continent by spreading Islamic teachings," he added. Paying homage to the saints, he stressed for reviving of the Khankahi system in the country. Earlier in his address, State Minister for Information Sumsam Ali Shah Bokhari welcomed the guests. He lauded Prime Minister Syed Yusuf Raza Gilani for his political sagacity and reconciliatory policy, which had proved helpful in elimination of terrorism and extremism. He also prayed for stability, solidarity and peace in Pakistan. At the end, the Sajjada Nasheen of Sharqpur Sharif led a collective Dua.